National Pet Expo March 2015 - That Guy with the Birds! 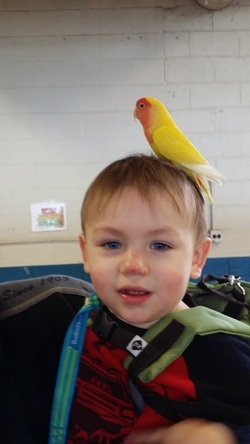 There's a bird on my head! March 6-8 at the Pennsylvania Farm Show Complex in Harrisburg PA, we were visited by hundreds of people at the National Pet Expo! From Cats & Dogs to Pigs and Horses, you could see just about any kind of domestic animal at this great show! Be sure to check out their website at www.nationalpetexpo.com for more information about their next show! We'd like to thank Denise Parsons and Bob Dobart of Equestrian Promotions, Inc for having us and of course everyone that came out and stopped by to see "That Guy With The Birds"
Hope to see everyone next year! Pictures at The national Pet Expo in Harrisburg Pennsylvania! Thanks to everyone that stopped by to hold the birds!